A compact shrub with glossy leaves that have a slight twist. 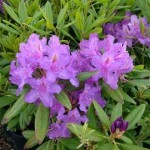 The flowers are royal purple with a greenish brown blotch in late May. Thrives in sun to part shade. H-2. It prefers a moist, cool, acidic well-drained organic soil. Removal of spent blossoms encourages new growth and future flowers.